It was the Great Navigator himself, Christopher Columbus who discovered Costa Rica. The year was 1502, and Columbus was making his fourth and final voyage to the New World. For the next 320 years, Costa Rica, the “Rich Coast” was a Spanish colony. 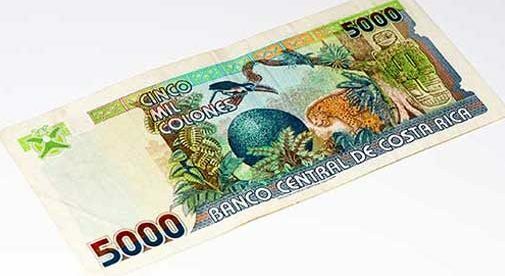 It is no surprise then, that the first real currency used in Costa Rica was Spanish in origin, manufactured in Spain, and was called pesos. Costa Rica declared its independence from the mother country and later established itself as an independent republic—and with that came a new currency. Since 1848, the flag and shield have been used as the official symbols and the basic unit of currency was called the colón—named after Christopher Columbus, whose name in Spanish is Cristobal Colón. U.S. dollars are widely accepted, especially in common tourist locations, but the exchange rate you’ll get may not be the best. So, it behooves you to understand the local money and to use it. Lately, the exchange rate has been hovering around 560 colones per $1. Paper denominations are most common in 1,000 (red in color,) 2000 (blue,) 5,000 (yellow,) 10,000 (green,) and 20,000 (orange.) The fastest and easiest approximation to U.S. money-thinking is to double the colón and drop some zeros. So, 1,000 colones would be approximately $2, . 5000 colones would be about $10., aAnd 10,000 colones would come in around $20. Yes you are right in thinking for large amounts you’ll be off a bit, so it’s best to use math and a calculator. But, when you’re in the midst of a transaction, that can get hard and confusing, the “double and subtract zeros method” is what we all use for a quick reference point. ATMs are called cajeros automáticos here and are found all over Costa Rica. Some U.S. banks charge a fee to use an ATM abroad—check with yours beforehand, so you’ll know. But even so, you can withdraw the maximum your bank will allow. In my case, I can get $750 at once with a transaction fee of only $3.50. That gets me C420,000 which goes a long way in Costa Rica. VISA and MasterCard are accepted in all but the smallest dives or for public transportation. However, other credit cards are not—even if you see a sticker in the window for Discover or AmEx, etc., they may not actually accept them. Some credit card companies charge an international usage fee at each transaction, but many do not. It’s best to check first so you’ll know which card you should use while here. Also, notify them ahead of time that you’ll be traveling in Costa Rica, or they may automatically block your card as a fraud protection precaution. All purchases in Costa Rica have a 13% tax—often this is already included in the published price. Hotels usually have a 3% surcharge. The tip at almost all restaurants is also included. It is standardized at 10%, so no further tip is expected or necessary. Taxi drivers do not get tips in Costa Rica, however, you may want to tip bellhops, maids, etc. An appropriate amount would be about 500 colones—a dollar. But, North Americans often decide to tip “heavy,” because it is so cheap compared to what we’re used to; please don’t do it. Tip in a reasonable and customary fashion that is culturally accepted. In trying to “help” you can actually cause harm. I’ve had many Costa Ricans complain that they can no longer afford services they used to use, because North Americans have inadvertently artificially inflated costs by over-paying and over-tipping—especially in the tourist areas. So, with all that background, what’s the bottom line? Even though Costa Rica is the most expensive of the Central American countries, it is still a bargain by North American standards. A budget-minded person can get by on $40 per day. That would cover public transportation, lodging, and meals. Economy lodging can be had for $20 per person and a casado (think “blue-plate special”) is usually about $5. Average midrange prices for very comfortable accommodations are commonly available for $60 to $80 per night, with meals in this range commonly about $15. These are found all over the country. Well there you have it—my two-cents worth—or I should probably say my two-colones worth.